When it comes to ensuring quality, Leader Plating follows two objectives. The first one focuses on being able to consistently meet and exceed standards set by the automotive and other industries. The second one involves the ability to surpass personal expectations of our clients. For these reasons, we subject all products to our own barrage of field-tests and hand-inspect every plated unit. With the strict quality controls in place, it is no wonder we produce at such impressively low rejection rate. To ensure the most efficient operation possible, we have established a fully computerized production run with a complete inventory of spare machinery parts in-stock to minimize downtime. Our equipment undergoes yearly evaluation and upgrade to help us maintain our position at the leading edge of the industry. Leader Plating has established a system for reclaiming metals used in the plating process. After being reclaimed, metals (copper, nickel, etc.) are recycled. We don't even allow the water to be wasted. Our system works so well that we have been featured in a documentary film by Environment Canada as a shining example of environmental responsibility. 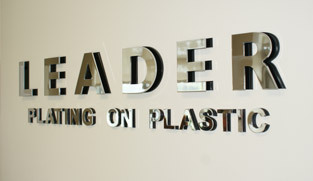 Leader Plating has been in business for over 30 years. We select only the best professionals to work with us in providing the quality service our customers have learned to expect. We gladly take on challenges and work through all the details with our customers to make sure they get exactly what they want and even more. Over the years, our customer base has grown almost exponentially. We have worked with industry giants as well as individuals who were looking for small re-chroming jobs. There is really nothing we can't handle when it comes to plating. See some of the Chrome Plating on Plastic jobs we have done in the past to get an idea what we can do for you.